By learning how to make angel food cake desserts, you can make this very popular family treat, for carry in dinners or for special occasions. They can be very simple to very elaborate. They can be also very easy to make if you choose to purchase one from your local bakery or even if you choose to make one from a box mix. One made from scratch might be a little more time consuming but there is just no comparison in taste. Many people think you need fruit served with angel food cake but a homemade is very moist alone and so delicious. I learned how to make angel food cake desserts many years ago. My husband always had high cholesterol. The doctors said he was born with it and would have to “battle” it. His doctor suggested the angel food cake for dessert because it had no fats or yolks in it; it was considered healthy for his problem. After trying several recipes, I settled on one. It is so moist and delicious and I have made it for fifty years. It really is simple to make once you get the technique down. 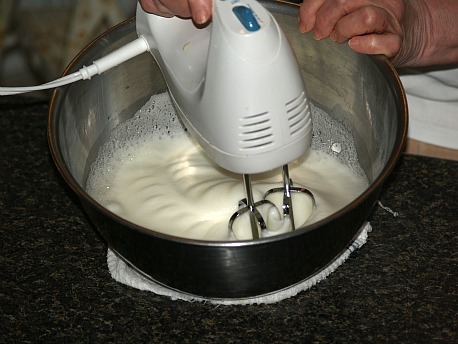 To make the homemade variety for your angel food cake desserts means learning how to whip egg whites. This may sound simple to many of you but problems can arise. If you bake a lot, you will have to beat whites for things like meringue and frosting as well as cakes. Several years ago when I was whipping egg whites, they would not whip up like usual; I blamed it on the humidity in Florida that day. In other places after that when I had a slight problem, I blamed it on the altitude. Recently when making one for an angel food cake dessert, it was a total disaster. By now, I had to get to the root of the problem. I consulted with many on the problem and all pointed to the age of the eggs. I remember when I was young my Aunt Ruth raised chickens for the eggs. She would collect the eggs and they were left on the kitchen counter; each day the eggs would be rotated. I remember her saying the eggs were at the best when three days old; especially if whipping the egg whites. After giving a lot of thought to this cake for my angel food cake desserts, I got to thinking back when I first started having problems with the whites whipping up. It hit me! I had switched to a national brand of eggs thinking I would get more consistent egg quality right before the problem began. After consulting with professionals in this field, I was told legally they have three to five weeks from the time of “egg laying” to the expiration date on the package; that is a long time. I checked my box of eggs for the date; even though I had the eggs for a week; I still had four more weeks until the due date. I would say that is stretching it even more. I decided after this “cake flop”, it was time to change eggs again. Like usual, I separated the eggs while cold, placing the yolks and whites in separate containers. This MUST be done so not one speck of yolk gets in with the whites; it will prevent them from whipping successfully. The best way for me to do this is to crack the egg and gently place the egg in my CLEAN hand. I let the white run down between my fingers into a small bowl; then place the yolk in another bowl. If there is no yolk in the white, I dump it into the mixing bowl. I follow this procedure with each of the twelve eggs. After all eggs have been separated, refrigerate the yolks (I use them for noodles). Let the whites sit at room temperature about 70F degrees with low humidity for 30 to 40 minutes. By adding a little cream of tartar to the whites, it will help to hold the fullness of the beaten whites while folding in the other ingredients. This brings me to the “folding”; this is not “mixing” or “beating”. Folding is gently turning the whites over until the dry ingredients are “just” blended. 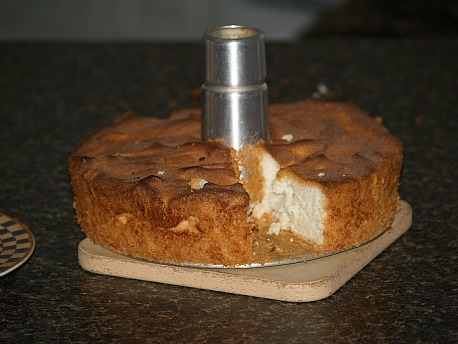 If you are learning how to make angel food cake desserts or just plain eating the cake, you want the cake to stand tall. DO NOT grease the pan; the cake must cling to the pan in order to hold it up. After baking, immediately turn it upside down until COLD. The cake is usually so tall that I hang it on a heavy bottle until cold. When it is cold, run a long thin knife around the pan to loosen the cake. It is now ready for you angel food cake desserts. WARNING: If you eat one bite, there will not be any left for your dessert! Measure flour and sift; measure again. Add powdered sugar to flour and sift together 2 more times. Add cream of tartar and salt to the egg whites in large mixing bowl. Beat egg white mixture on medium speed until foamy. Add granulated sugar 2 tablespoons at a time while beating until stiff peaks form. Gently fold in vanilla and almond; gently fold in sifted dry ingredients ONLY UNTIL BLENDED. Carefully push batter into UNGREASED tube pan. Bake in preheated oven at 375F degrees for 30 to 35 minutes until golden brown. IMMEDIATELY turn upside down on a heavy bottle until COLD. 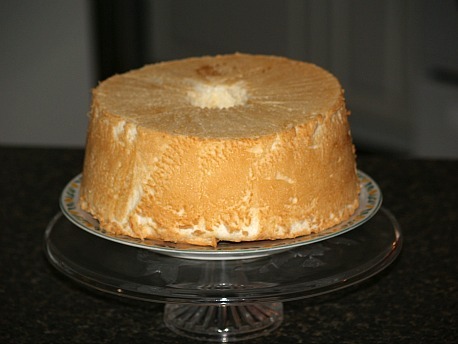 This angel food cake dessert is made by slicing the cake and filling it with creamy pineapple mixture. Combine and cream butter and sugar until fluffy; add yolks one at a time beating after each. Stir in lemon and drained pineapple; fold in sour cream and beaten egg whites. Top layer with half of creamed mixture; place next layer of cake on top. Top second layer with other half of creamed mixture; top with remaining layer of cake. Cover pan with plastic wrap and refrigerate overnight to set. Run long thin knife around edges of pan. Place cake plate over pan and gently turn upside down onto plate. There are many wonderful angel food cake desserts for trifles. Almost any fruits and other dessert ingredients can be used in the layers; always producing great flavors. Crush candy bars in food processor or place in zip lock bag and crush with rolling pin. Add melted butter to beaten eggs and blend well; blend in powder sugar and vanilla. Fold Cool Whip into egg and sugar mixture just until blended. 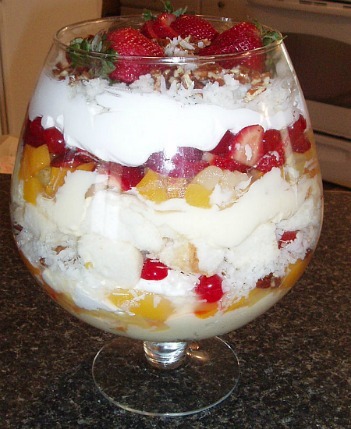 Layer half of cake pieces in trifle bowl or a 9 X 13 inch dish. Top cake with half of the creamed mixture, then half of the Butterfinger pieces. Add on top remaining cake pieces, then the remaining creamed mixture. Top with the remaining Butterfinger pieces; cover and refrigerate overnight.